Blake Wilner celebrated his birthday and the anniversary of his engagement on Wednesday night at Hippos. Also present at his party were Brandon Allen (alto sax, occasionally tenor), Sam Anning (double bass) and Ben Vanderwal (drums). Blake, of course, is guitarist and leader of the Blake Wilner Quartet. BWQ are currently touring Australia. Apparently, the whole band originates from Perth, but they are now spread widely. Blake and Brandon are resident in London (Brandon told me he’s been there for 6 years); Sam is in Perth; Ben is in Melbourne. They played instrumental jazz with lots of energy. I heard Euro jazz in some of the alto playing. There was Scofield in there too (the last tune was a Scofield composition). It was great playing all around. I especially loved the complex unison lines by guitar and alto (a sweet-sounding combination) and the all-in improvisation (reminiscent of 60s avant-guard). This trad-jazz approach of concurrent soloists bouncing off each others’ lines seems popular at the moment. Looking up, it seemed like a grunge jazz session. Brandon played, bent over his alto, wearing black t-shirt and moving with muscular, angular motions. Blake played with beanie and t-shirt and looked relaxed but committed. Sam played steadily, and with power when the band lifted, and also played several effective solos. Ben was all over the kit, with complex polyrhythms and lots of rhythmic movement. BWQ gave an energetic and powerful display; a performance that confirms the quality of Australian modern jazz these days. Ben Winkelman arrived in Canberra with considerable publicity (posters, and several articles in local papers) and a few weeks after he was originally booked. It was worth the wait. 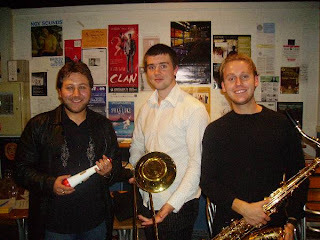 The Trio that performed in Canberra were Ben Winkelman (piano), Desmond White (acoustic bass) and Ben Vanderwal (drums). It was an fascinating night of eclectic original compositions, presumably penned by Ben W himself. The compositions covered a wide range of styles and motifs. There were stomps, rags, tangos and classical flourishes. There were dedications to deceased cats and Jelly Roll Morton, and German literature in the form of Thomas Mann. Ben W plays a rich style of piano: big chords, orchestral flourishes, parallel octaves, stride, and more. To me it was a Euro-style (he’s a student of Paul Grabowski) and his classical training was evident. Ben Vanderwal was a fascinating drummer, more an accompanist than a rhythm keeper. He would switch drums and cow bells, rolls and patterns, sticks and brushes and mallets continually, perhaps every 4 bars, perhaps more often. This was a rich landscape of percussive sounds to accompany Ben W’s complex and varying style. There were 4/4 passages and solos in there too, but they would be interspersed with odd added bars or be reformed as a totally different styles. Des White provided lots of bass solos, but he was also a foundation supporting all this variation, but seldom with just a walk or a simple pattern, although there were one or two of these in there too. The changes were organic. They were responsive to jazz, latin and other music history so they were self-evident and not jarring. But change there was, lots of it. It was an attentive audience, and Ben commented on it. But I think a large part of that came from the richness of the music on offer, and the calm, friendly and intelligent way that Ben spoke between tunes. This was a night of contemplation, and of rich engagement and exploration from young but surprisingly mature players. So it was a special night at Hippo’s. Ben promoted his new CD several times during the night, and highlighted its success as a runner up in the Bell Awards. Given this show, I expect it’s quite a journey. Canberra is lucky to be the site for the main research collection on the history of jazz in Australia, the Australian Jazz Archive (AJA) and its sub-collection, the National Register of Australian Jazz Interviews. The AJA is held at the National Film & Sound Archive (NFSA), located near the ANU. It's a national institution which holds many items relating to the history of jazz in Australia: sound recordings, film, videos and oral histories. Here are some links to start your research if you wish to investigate the AJA further. But the tunes were an interesting collection played thoughtfully and with considerable variation. About half the tunes were original (penned by both Neils and Michael) and several interpretations were solos or strongly featured one player. There was also a lovely breadth of styles. Mingus’ Jelly Roll was treated with the respect for, and knowledge of, history that the tune deserves. Contrasting with this was a funky acid jazz original by Michael which ended the show on a high. Non-originals included Some time ago, Wayne Shorter’s Deluge and Neil’s solo on Round midnight. Michael performed a solo rendition of Herbie Hancock’s Dolphin Dance with synth effects that harked back to Hancock’s rhythmic-rich bands, but also was free with time signatures so breaking from the normal interpretation. Neils put on show his freedom with harmonic treatment and wide intervals, his ability over the full range of the instrument, and his playfulness with strained high notes and honking low notes. Valdis played clear heads and inventive solos with that characteristic mixture of bell-like tone and honky blat that is the trombone - lovely! I also noticed the horns blending sweetly with clear and balanced harmonies, which I assume were improvised. Michael provided a strong, dense and often staccato support which propelled all this along, and sizzling solos when he had the floor. So, perhaps the music was better than the humour, but, hey, you can’t have everything.